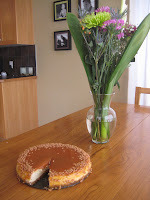 This is the cheesecake I made using my fabulous new standing mixer, an unexpected Mothers day gift from my family. It's unfortunate that I don't have many pictures from yesterday because it was a wonderful! Talon waiting to dig in! This is totally random, but I thought it was funny. 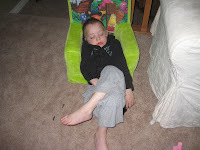 Talon fell asleep like this one afternoon. Yah, a new post. So, was the cheesecake good? You always make the yummys treats... You need to start sharing recipes on your blog! A standing mixer... woo hoo! That's great! Share the baking with me any time.. I don't do much of that as you know. The boys are cute as always! 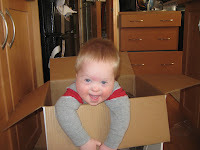 Love the pictures of the "boys-in-th-box". I really want that cheesecake receipe, you should post it. I'm glad you had a nice mother's day! Love the new layout, looks great... so does your cheesecake by the way. You can make me some when you come home which is soon!!!!!! 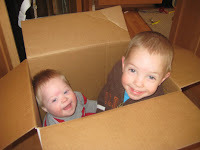 Yeah!Cutest boys in the entire world I might add. I can't wait to squeeze them and kiss them! 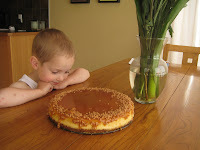 I know you're gone by now, but that cheesecake is calling my name!! You have to give me the recipe as soon as you get back!